Congestion cost UK motorists more than £37.7bn last year, with drivers spending an average of 31 hours a year in jams during peak hours. According to the INRIX 2017 Global Traffic Scorecard, the direct and indirect costs of congestion to all UK motorists cost drivers an average of £1,168 each. London remained the most congested major city in the UK for the 10th year in a row, ranked second in Europe after Moscow and seventh in the world overall. London drivers spent approximately 74 hours a year in congestion during peak times, at an average cost of £2,430 a year. Congestion cost the capital as a whole £9.5bn from direct and indirect costs. Dr Graham Cookson, chief economist, at INRIX, said: ‘Combined with the rising price of motoring, the cost of congestion is astonishing – it takes billions out of the economy and impacts businesses and individuals alike. According to INRIX, the UK was the 10th most congested country in the world, and third most congested in Europe, with Russia the most congested. Manchester, Birmingham, Luton and Edinburgh were the UK’s next four most congested major cities. Drivers in Manchester spent 39 hours in congestion during peak hours at a cost of £1,403 each. 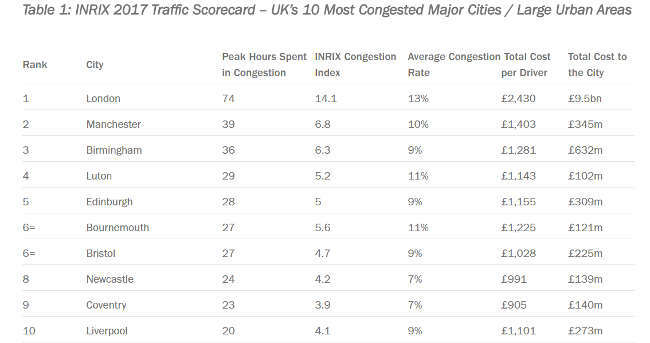 INRIX analysed congestion in 111 cities and towns in the UK. It calculated direct costs as the value of fuel and time wasted, while indirect costs relate to freighting and business fees from company vehicles idling in traffic that are passed on through higher prices.